These Baked Ham and Swiss Rolls are soaked with an umami rich sauce and topped with everything seasoning mix. The end of Daylight Saving Time always throws me off. Sure, we get that “extra” hour of sleep as we set our clocks one hour back, but for the following week my body and sleeping schedule is out of sync. The early sunset at 4:52pm makes my day feel incomplete. I haven’t had my fill off daily sunlight. Early nightfall means I’m eating dinner by 5:30pm and in bed before 10pm. I don’t like it. Not one bit. Rather than dwell on missing summer, I’m eating carbs. 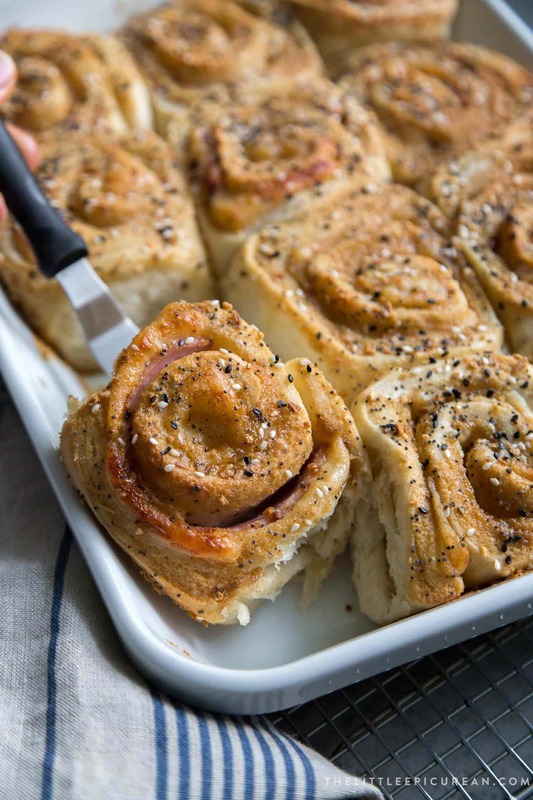 I’m stuffing up on breads, buns, and these savory Baked Ham and Swiss Rolls! As you know, I am a fan of bread rolls. 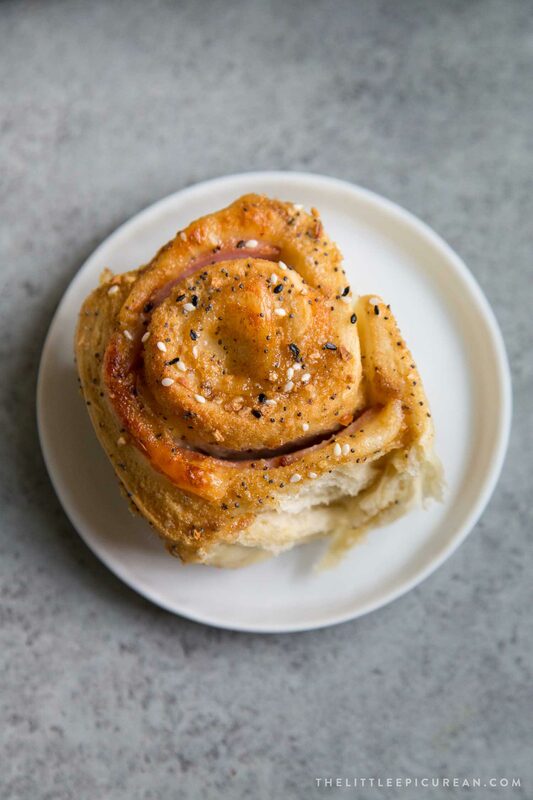 There are a ton of cinnamon roll variations on this site: birthday funfetti rolls, cookies and cream rolls, and coconut jam cinnamon rolls. 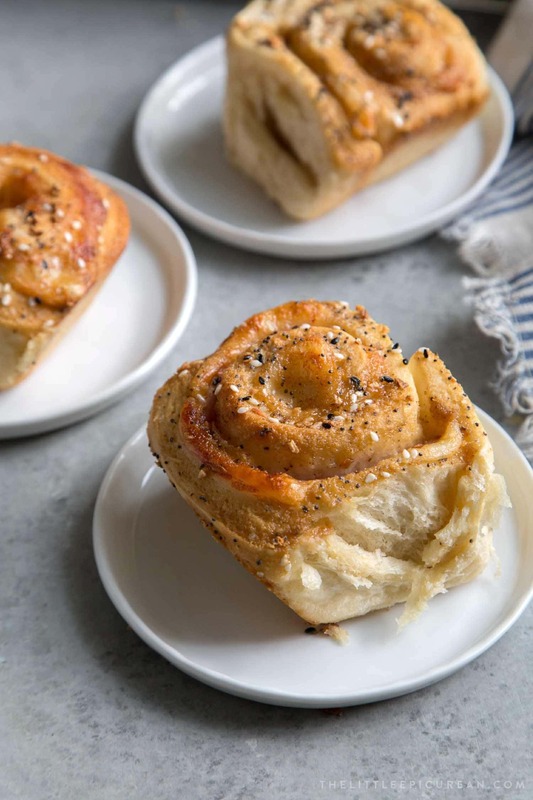 There are also quite a few savory rolls including these cheddar scallion rolls and “French Onion Soup” caramelized onion gruyere rolls. Expanding my savory roll collection, I introduce you to these heavenly baked Ham and Swiss rolls. They’re hearty and cheesy with just a hint of sweetness. I used thick cut Swiss cheese slices and cut them in half into smaller rectangles. Slicing the cheese into smaller portions makes rolling the dough easier. This recipe uses packaged Canadian bacon for ham. Canadian bacon has no resembles to American bacon. Canadian bacon is made from pork loin, unlike American bacon which comes from pork belly. The Canadian bacon is sliced in half and shingled across the cheese. Once again, this is done to help making rolling the dough easier. There are countless variations of this butter based mustard sauce. It is made by mixing together melted butter, dijon mustard, a touch of sugar, and a combination of spices and herbs. The “secret” ingredient that brings the sauce together is worcestershire sauce. This magical sauce adds a ton of umami flavor. Made from anchovy, vinegar, garlic, onion, and tamarind, worcestershire sauce adds that addicting flavor you just can’t pin point. DOUGH: In the bowl of a stand mixer, combine yeast and warm milk. Stir together and let sit for 5-7 minutes to activate yeast. Whisk in egg until combined. In a large bowl, whisk together flour and salt. Attach dough hook attachment to stand mixer. With the mixer running on low speed, add flour mixture about one cup at a time. Once all the flour has beed added, add softened butter one tablespoon at a time. Increase mixer speed to medium and knead until dough is smooth and no longer sticks to the sides of the bowl, about 3 minutes. Transfer dough to a lightly greased large bowl. Cover bowl and let sit at room temperature for 60-75 minutes until dough has doubled in size. Punch down risen dough. Transfer to a lightly floured work surface and roll into a rectangle about 20 x 14-inch. FILLING: Spread softened butter evenly over dough. 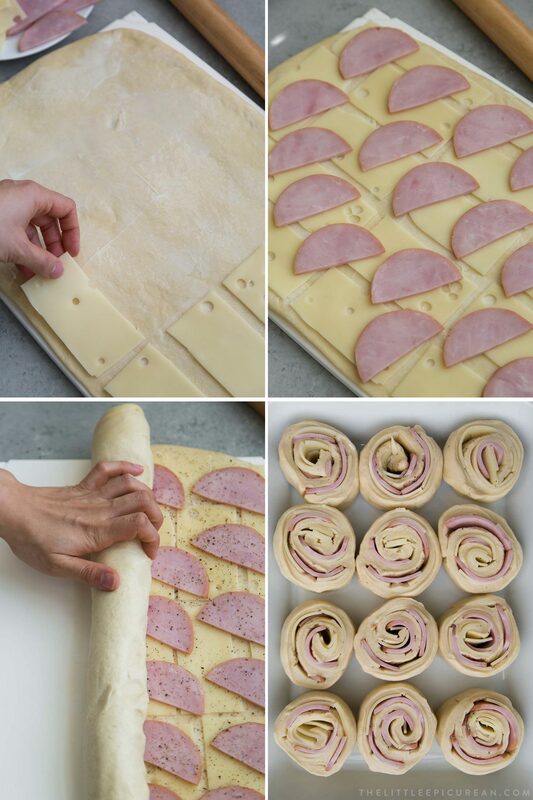 Arrange sliced Swiss cheese over dough. Top with Canadian bacon slices. Season with freshly ground black pepper. Starting at the long side, roll dough into a tight log. Place log seam side down on cutting board. Slice log into 12 equal portions. Place slices in a greased parchment lined 9x13-inch baking pan or casserole dish. Cover with plastic wrap and let rolls rise for 30-45 minutes at room temperature until the rolls have puffed up and are touching each other. Meanwhile, preheat oven to 350 degrees and prepare sauce. SAUCE: In a sauce pot, melt butter and sugar over medium heat. Once melted, add worcestershire sauce, dijon mustard, garlic powder, onion powder, and black pepper. Stir to combine. Remove from heat and allow to cool. 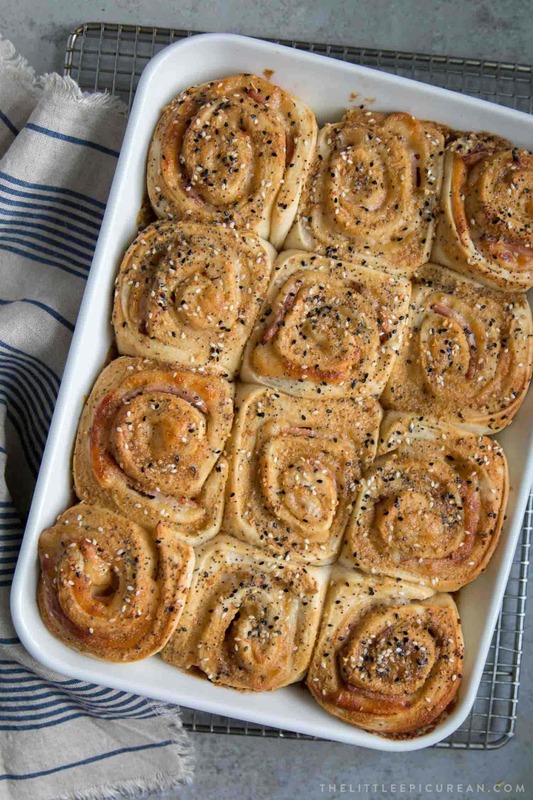 BAKE: Uncover risen rolls. Drizzle sauce over rolls. Top with everything seasoning mix. Bake for 33-35 minutes until the bread is golden and the internal temperature of rolls registers at least 185 degrees F on an instant read kitchen thermometer. Let rolls sit in pan for 5-8 minutes until running a knife or mini offset spatula to loosen rolls from pan. Serve baked ham and Swiss rolls warm. If using INSTANT YEAST: Mix yeast, milk, egg together in stand mixer. No need to let yeast sit for 5 minutes. Add flour mixture and proceed with original instructions. Dough can be mixed by hand. Use a large bowl and sturdy spatula for mixing. Proceed by kneading dough by hand until dough is smooth and elastic. 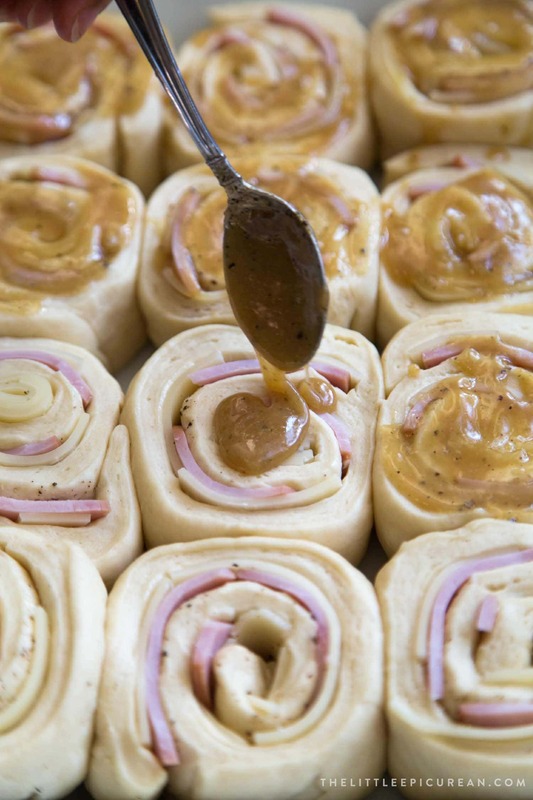 MAKE AHEAD: Dough can be prepared ahead of time. Follow steps leading up to plastic cut rolls in greased pan. Cover with plastic wrap and let chill in the fridge overnight. Before baking, allow rolls to sit at room temperature for 30-45 minutes til reactive yeast and allow rolls to rise. Bake as directed in instructions. Can I make the dough by using hands? I dont have a mixer. Yes, this dough can be mixed and kneaded by hand.